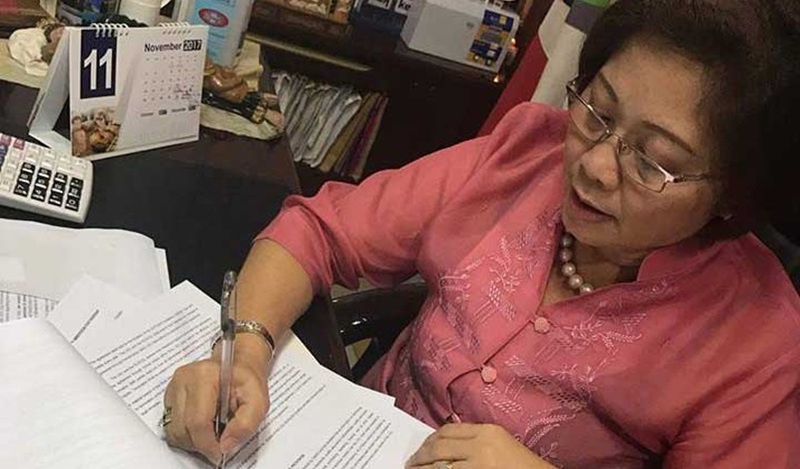 After suspending Panglao Mayor Leonila P. Montero for three months without pay for simple misconduct, Ombudsman Conchita Carpio Morales, taking “a second hard look at the evidence”, found her guilty of grave misconduct and ordered her dismissal from the service. The five-page joint order signed by Morales on January 18, 2018, also canceled her eligibility, forfeited her retirement benefits and imposed the penalty of perpetual disqualification to hold public office. An earlier ten-page decision of the Ombudsman approved by Morales on October 26, 2017, found Montero guilty of simple misconduct and ordered her suspended from office for three months without pay. Montero was accused by Augustin Cloribel, a resident of Barangay Lourdes, Panglao and known as a strident critic of the mayor for grave misconduct, gross neglect of duty and conduct prejudicial to the best interest of the service before the Ombudsman-Visayas on August 14, 2015. The complaint centered on Montero’s appointment of her PDP-Laban party-mates who lost in the 2013 elections – vice mayoralty candidate Noel Hormachuelos as municipal administrator/consultant for administrative services and candidates for municipal councilors, Danilo Reyes, public information officer and Apolinar Fudalan as public employment service officer (PESO) coordinator and livelihood (Tesda) and Information Technology consultant. Montero also appointed Fernando Penales consultant on infrastructure and engineering services who ran and lost as municipal councilor under the United Nationalist Alliance (UNA). The original complaint for grave misconduct was downgraded to simple misconduct since there was no showing that Montero was motivated by corruption, willfully intended to violate the law or disregard established rules, according to the Ombudsman. Montero also maintained that the assailed appointments do not fall within the one year prohibition since they are on job order basis. However, the Ombudsman took a “second hard look” at the evidence presented by Cloribel and admitted that it was “impressed with merit” resulting in the dismissal order. Cloribel, in his MR, asserted that Montero’s misconduct cannot be characterized as simple because she was motivated by corruption, clear intent to violate the law and flagrantly disregarded established rules when hiring the four losing candidates. The hiring of Hormachuelos, Reyes, Fudalan and Penales was described by Cloribel as a “political accommodation” by Montero to her defeated partymates that should hold her liable for conduct prejudicial to the best interest of the service. The appointment of the four losing candidates who were already rejected by the people, “unduly undermined the intent of the electorate and tarnished the integrity” of the mayor’s office, according to the joint order of the Ombudsman. But the Ombudsman denied Montero’s MR which were mere rehash of the arguments in her previous pleadings and was considered and found without merit. In its earlier ruling, the Ombudsman firmly invoked section 6, Article IX-B of the 1987 Constitution and section 94 of the Local Government Code expressly prohibiting and disqualifying the four appointees within one year after an election to be appointed to hold any public office. The Ombudsman was not swayed by Montero’s “boasts” of an award from the Department of Interior and Local Government (DILG) of a Seal of Good Housekeeping as proof that her leadership adheres only to the stringent standard of transparency, integrity and service delivery. After careful examination, the Ombudsman also found that the tasks performed by the Hormachuelos, Reyes, Penales and Fudalan were not merely on a daily or casual basis as claimed by Montero but appeared to assist in her duties as chief executive. The Ombudsman also pointed out a flaw in her reasoning that she relied on the SB resolution to hire the four appointees as “unmeritorious” considering that the SB “only gave her the authority, not a directive” to hire. When asked to respond to the Ombudsman order, Montero told the media that she has yet to receive a copy of the order.